It's Monday and I'm bundling myself up to take a walk out in the cold and pick up my son from the childminder’s. If you would've told me five years ago, I’d now be living in a picturesque English village with a new husband and baby, I would have laughed in your face. And then laughed some more. However, five years ago my life decided to take an interesting turn. All because I decided to talk to the guy who came and stole my seat. It was a crisp and sunny New York City day and I was in the middle of the ultimate girls trip, I wasn’t even originally planning to go on. I had just left my ex-husband, walked out the door and, literally, left everything behind. Money was tight (isn't it always) and I was trying to sort out what this new single life was going to be. I knew it was the right time to move away from Florida. I had lived there my whole life. So when five of my girlfriends planned this trip, I thought maybe, at the least, I'd be doing some due diligence. Maybe New York could be a contender for my new home? We arrived at the Bohemian Beer Garden early enough in the day that we were able to get some seats at a table. If you've never been to this slice of paradise in New York, it is a great spot to sit outside among big communal tables, grab some beer and eat some Polish food. It has a very Oktoberfest vibe to it and when the weather is just right the hall gets packed! It was one of those beautiful spring New York days and soon enough, you couldn't walk around. I had left the table to go get another drink and when I arrived back, this guy was sitting in my spot. I found out later, Phil had been looking our way for the past few hours trying to make his way over. Catching up with my friends at our table, I was oblivious to it. When he and his friend had arrived, they couldn't find anywhere to sit and had been standing for hours. He took my short exit as an opportunity to make his way over. Most of my friends were in awe once he started talking. They already thought he was cute but his English accent enamoured them. I couldn’t care less about it, but conversation flowed well enough and when we left to go to the next place, part of me was sad to say goodbye. I told him where we were going and I wished him well for the rest of his trip. I grabbed my things and started walking away. Just as I was exiting out the front door, I felt an arm on my shoulder and there Phil was. Phil had told his friend he would meet up with him back at the hotel. We both smiled and off we went to continue our very important conversation about music. We are both music fanatics. I couldn't tell you what time Phil and I arrived at Sweet Afton as I was totally caught up in the adventure of the night. I knew I wanted to kiss him, but I didn't want to start making out in the bar. I was trying to have a little bit of dignity because I was very aware that I had been drinking all day. I suggested we go for a walk because the bar was loud. He obliged. As soon as we made our exit, I held his hand and gave him a kiss on the lips. It was short and sweet and he went back for another. It was obvious that we had a connection and the buzz of being in New York City was adding to the impulse of the night. It was, however, coming to a close, as only one of my friends had stuck around at this point. (Thanks Hilary!) I knew we had to get back to the rest of her friends, so we exchanged details and, sadly, went our separate ways. The next day there was a message in my inbox talking about the night before. I invited him to come visit me in Florida. He wouldn't come, of course, but it was nice to think he might. Back at work on Monday, and by the end of the week, it was very apparent that we were still excited and into each other. We spent most of our days chatting and learning more about each other. The next thing I knew, Phil had taken me up on my offer and booked tickets to come visit me in Florida! To say I was nervous would be an understatement. This guy, who I had only spent a few hours with, was spending the money on flying over to stay with me for a week! My girlfriends soon became the cheerleading squad, while I remained the reasonable one. The day before he arrived, I came down with the flu. I barely made it out of my house to meet him at the airport. Was this is a sign? Off to a rocky start, we managed to still have a great time and the conversation flowed just as easy as it did the first night we met. I was against this going any further, so I found myself trying to nitpick and find his faults. This was not going to work. How would it ever work? We lived in two different countries and we weren’t young lovers in our 20’s, with time to take a chance. The week ended as quick as it began and although I tried to keep a distance when he returned to England, we still found ourselves talking to each other for hours a day. Determined that it was not going to work, I made plans to visit some friends in Austin with the intention of figuring out how I would be able to move there. Austin was high on my list of places I wanted to move to and the trip was nearly perfect. But still, I found myself wondering how I could do it? Would I continue to keep talking to this guy in England but continue to move forward into the future, further away from him? I put the Austin idea on the back burner and three months later, Phil was back in Florida to visit me. It was apparent our feelings were getting more intense for each other. My cheerleading squad became louder and louder, and suddenly this whole new future seemed weirdly possible. I made plans to visit him in Liverpool, where he was living at the time. I could only take a few days over Thanksgiving break - America's vacation time is not generous. It made sense for me to move there, didn't it? I couldn't expect Phil to give up his NHS healthcare and good paying career. I wasn't 100% in love with my job, since I had already been making plans to move out of state. How was this going to work exactly? It wasn't as simple as saying, I'm going to move to England. We really had to have a conversation on how serious this was going to be. My divorce wasn't even finalised yet. I swore that I was in no rush to get married again. And yet, I found myself looking up information on spouse visas and what the requirements were. I wanted to work and make a life in England. I didn't want to just visit and go back and forth for the next several years. On his visit in January, Phil surprised me with a night at the fanciest hotel in town and romantically proposed. He had even gotten some of my girlfriends in on the secret and they helped him secure the ring while keeping me in the dark about any of it. This was really happening! I was jumping in! My life, up until this point, had been going in a completely different direction. One I thought was supposed to be the right path for me. 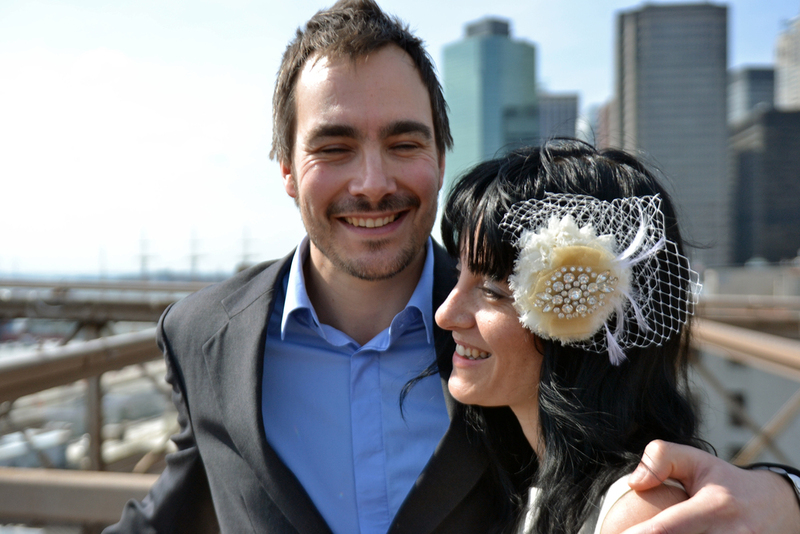 It is only fitting that we returned to New York City the following spring, surrounded by a small group of our closest friends and family, and were married at the historic City Hall. We had a wonderful week together. Our families had a chance to meet and get to know each other for the first time. Sadly, because of the stipulations of applying for the Visa, four days after we got married Phil went back to England and I went back to Florida. We planned to send our marriage paperwork as soon as we could, but the vagueness of the Visa office meant it could be two weeks to 6 months. It was torture thinking about how long we might actually be apart from each other. However, just like everything else in our relationship so far, we perfectly got our approval in two weeks. A week later, I was on a plane and moving to England. As soon as my plane lifted off from the runway in Florida, I burst into tears. It might have been the relief of the stress of pulling it all off. I had managed to sell almost everything I owned and now my only possessions fit into two suitcases. I couldn’t believe that I was taking this chance, even as I flew towards my new life. I couldn’t believe how happy I was. March marks four years of marriage and we are still as happy as the first day we met. Like some weird fairy tale, we have found this perfect love. We welcomed our son Oscar in September 2014 and every day, either Phil or I will comment, still in astonishment, about how happy we are. If he had not come and sat down, if I had not invited him to come visit.